She’d come to the party with someone else. He’d come alone. A game of Truth or Dare was underway. She chose a dare. “Ask someone to marry you.” She looked across the room and saw him there, leaning against the wall, smiling at her. She smiled back. “Will you marry me?” she called. “Sure,” he called back, “as soon as I have the $2.50 for the license!” Everyone laughed. They were young and confident that hard times would end. It was 1941. In December their world changed. Donnie went to war. “Will you write to me?” he asked. “Sure,” said Dee Dee. She loved to write letters. Over the next four years she sent him hundreds. He wrote back. He told her about New Guinea, about the nice girl he dated in Australia, about getting malaria. He saved his pay. He says there wasn’t much to spend it on anyway. Dee Dee worked at a defense plant in Lansing. She wrote her newsy, upbeat letters. Donnie treasured every one, but the army said soldiers in combat zones couldn’t keep letters, so he had to destroy them. Dee Dee kept the ones he wrote back. They got to know each other through those letters. And so they got married. 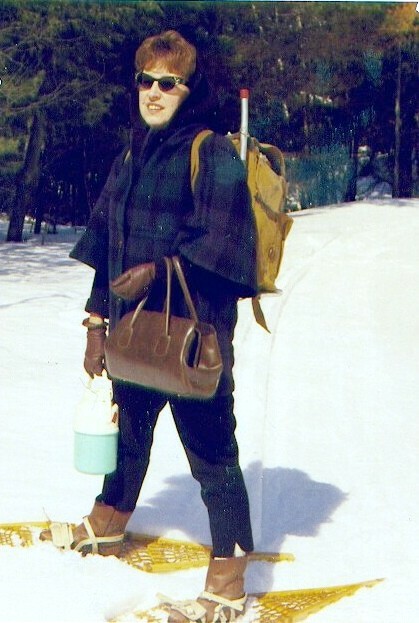 They honeymooned in a tent on a lot Dee Dee’s father had bought up on Grand Traverse Bay. 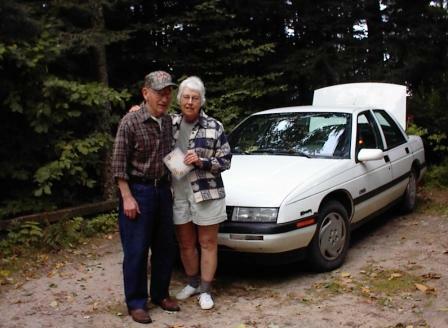 They loved the sandy bluff over the lake, and returned often, driving up from Lansing to spend weekends in the woods. Dee Dee’s father, who liked his new son-in-law, made them a present of the lot. Eventually they built a log cabin. On winter weekends they’d leave the car on US-31 and snowshoe in to the cabin, pulling a sled piled with supplies, their little girl riding on top. The years went by, and Don’s auto repair shop prospered. They added rooms to the cabin on the Bay. They traveled north as often as they could. They met other young couples along the shore, played softball on the beach in the summer, made picnics in the ice caverns during the winter. They loved the sound of the waves. They hated leaving on Sunday afternoons. They left later and later, and then they were spending Sunday nights at the cabin, getting up at 4:00 am so they could be back in Lansing in time to open the shop on Monday. It got harder and harder to leave. They decided not to do that anymore. In 1971 they sold the business and the house in Lansing and moved up north for good. They’ve been here ever since, making improvements to the cabin, getting together with friends for dinner and bible study and Scrabble and good talk, hosting visiting family every summer. Dee Dee worked at a nursery and learned photography. She makes notecards with her pictures of the Bay and the chipmunks that come to the back door for sunflower seed. She still likes to write letters. 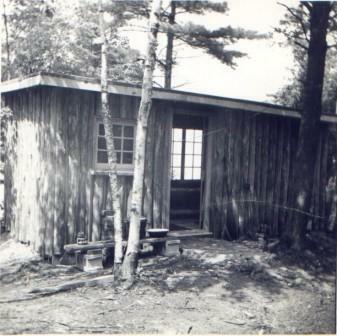 Don worked at an auto repair shop and tended the cabin and its complex of tidy sheds and winding paths. Until recently he climbed onto the roof to shovel off snow. Every summer he spent weeks cutting slabwood into firewood lengths for their two woodstoves, stacking it head-high in the shed. They took long walks, climbed the trails through the drumlins, and swam in the Bay. They vacationed in Grand Marais and North Carolina and traveled out west pulling a camping trailer. They delighted in grandchildren and great-nieces and company of all kinds. Last fall they held their first great-grandchild and celebrated their 62nd anniversary. They faced hard things with grace. Dear friends died. Don had by-pass surgery. Dee Dee has a new pacemaker. “I’m slowing down,” Don said a couple of summers ago, as he pushed a wheelbarrow full of firewood to the woodshed. They decided to heat with propane instead of wood. Dee Dee had a mild stroke. Don had a fall. They moved to their daughter’s house for the winter. There’s a big window overlooking the river, and they watch the deer at twilight. And here’s the thing. They still hold hands. When they look at each other, their eyes sparkle. They fill in the blanks for each other. They are so full of love, and being loved, that they have plenty to spare, and it flows over family and friends and a neighbor who comes to rock in the chair by the window and hear the stories again. I met Don and Audrey Gould – Donnie and Dee Dee – in 1996, when I fell in love with my own place in the woods and found it hard to go home on Sunday afternoon. They’ve shared their stories, their coffee and cookies, and their chipmunks with me, and taught me that if you can’t find it at Bachmann’s in Central Lake, you probably don’t need it. I am honored that they have granted me permission to tell their story. It’s a great introduction to Audrey and Don, but there’s so much more – if they wish to share it, and for you to write. I love the Torch Lake Views – hope it continues. Thank you for including the story of my aunt and uncle, Dee Dee and Donnie. It is beautifully written and perfectly depicts this loving couple who have always been a team. They love living on the Bay in Eastport! They are a big part of why I am in Antrim County today. You’re very welcome, Merrie. Don and Audrey are a big part of why I live here, too, and writing their story was a great pleasure. What a wonderful story of life and cherishing the time spent with family and friends in tandem with God’s creation of nature. Thanks for blessing me with it. I would like to read it to my sixth grade English students as a beautiful example of a couple’s life long abiding love, as well as a model of incredibly descriptive writing. I am proud to be a distant relative of Don and Dee Dee who show my children how marriage and companionship, through ups and downs, can be a true joy. Donna, it gives me great pleasure to think of you reading the story to your students, and I know Don and Audrey will be happy, too. I think 6th-8th graders relate very well to older people, and vice-versa. You might enjoy reading the Elk Rapids Oral History program post. Observing those interviews was like watching spring arbutus begin to bloom in the shelter of wise old pine trees.